In the second book of the series, Natalie sets about to win the lead role of Mary in her Sunday school class's Christmas play. Nat's bestest friend who is a girl, Laurie, and her bestest friend who is a boy but not her boyfriend, Jason, try to help, but the coveted role goes to Sasha, a not-so-nice girl, who is way too happy to see Natalie getting the part of a tree in the Christmas play. Nat hates rehearsals and misses the bit about costumes, which leads to the next disaster. She appears on stage as the only palm tree amidst the other evergreen Christmas trees. Yet during the performance, and even as she tries to steal the show, Nat is awestruck at the tiny Jesus in the manger and with the realization of what it took for God to send his only Son down here and to let himself get so little and be born in a smelly barn. As a result, Christmas will never be the same for anybody. About "Natalie Really Very Much Wants to Be a Rock Star (#02 in That's Nat! 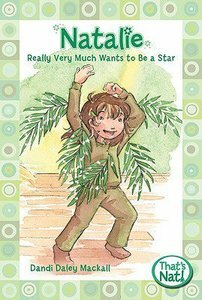 Series)"
Natalie has big five-year-old dreams for her future. So big, that her heart gets thumpy with excitement. Nat uses her very own words to tell about her hopes, struggles, and adventures. This makes the That's Nat! series perfect for young readers just ready for chapter books. Is There Something Better than Being a Star? Natalie tries out for the lead part in the Sunday school play. But not-so-nice Sasha lands the part instead. Being the star is all Natalie can think about---until something more important catches her heart.